If you would like to be alerted any time a donation is made on a particular giving page, make sure to subscribe to that page's gift alerts. Open the Actions drop-down menu in the upper-right corner of the Giving Page details and hit "Subscribe to Gift Alerts." 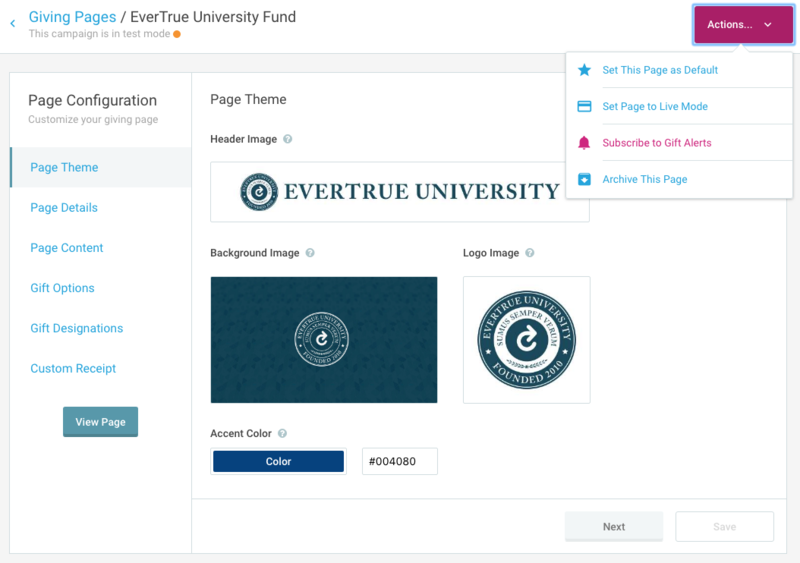 Any EverTrue user can choose to be notified via email whenever gifts are received. This setting is page-based, and you're welcome to subscribe to any and all pages you wish (i.e. a user can subscribe to a some giving page, but not others). To manage all of your giving page subscriptions, open your User Menu (just click your name in the upper-right corner), head to Settings >> Notifications and turn on/off "New Gift Notifications" for any given page. If you ever need to unsubscribe to gift alerts, you can do so by either navigating to that specific giving page, opening the Actions drop-down menu and clicking "Unsubscribe" or going to your Notification Settings (as mentioned above) and turning off the notifications for any page.